Hotel & Hostel Rila is situated in the center of Budapest, in a peaceful green area, close to the highway to the airport, just 3 stops by metro (M3 - blue line) from the heart of the city. The Hotel's \ Hostel's convenient location attracts hotel and hostel guests, individual travelers, as well as business visitors. Hotel & Hostel Rila also provides ideal environment for conferences and corporate seminars. For HOTEL(**) guests, Hotel & Hostel Rila offers single, double, triple and four-bedded rooms all with en-suite bathrooms (shower & toilet). Apart from these rooms, Hotel & Hostel Rila accommodates families and groups of friends as well offering five bedded studios - consisting of a single and two double rooms (the three rooms share a bathroom). For HOSTEL guests, Hotel & Hostel Rila offers double rooms with shared bathroom as well as dormitories up to 5 beds. These are perfect for couples, small groups or dorm guests. All the rooms are equipped with telephones. Free sheets, blankets, towels and soap are provided. Restaurant: In the hotel/hostel's beautiful Restaurant, decorated with wooden carvings of great marksmanship, we serve Hungarian and international dishes, as well as Breakfast (included in the price) In the attractive cellar of the Hotel/Hostel an atmospheric beer house / wine cellar awaits our guests, all year round. In the summer we operate an open-air terrace. 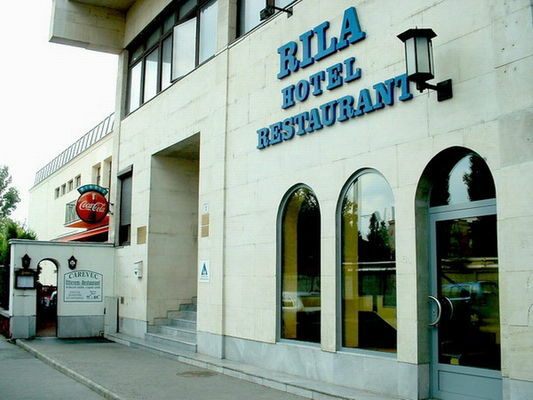 Parking: The Hotel & Hostel Rila offers its guests free parking lot in its court yard. Airport Transfer to/from Budapest Airport - Book a cheap airport/railway station transfer! • Breakfast is not included in room rates. It is available at 5 EUR per person. • Wireless Internet access is available in the whole building. • Using the Internet connection is free of charge. • The hotel is located in a free parking zone. • The hotel's own parking lot is available for the guests free of charge. • The hotel can provide parking place for buses. • Baby cots are available on request. • Children under 4 stay free in their parents' room if no extra beds are required. • Pets are allowed for an extra charge of 10 EUR per day. Please check if your travel dates are set correctly. Please set your travel dates. Please select an offer from the list below. 10% discount on normal prices in case of reservation min. 14 days before arrival. 15% discount on normal rates. 20% discount on normal prices. Do you need more than 5 rooms? Request an offer. Travelling with children? Need rooms for a group? Organizing an event? Request an offer. • The hotel only accepts reservations sent with valid credit card details. • The hotel requires your credit card details as a guarantee and does not charge it unless a late cancellation or a no-show occurs. • Reservations can be cancelled free of charge up to 2 days prior to arrival until 18:00. • In case of late cancellation or no-show the hotel charges the rate of one night as a penalty. • The hotel charges your credit card with the total sum of your stay upon reservation which is non-refundable in case of cancellation or modification. Your personal details as well as your credit card data are received and passed to the selected hotel through a secure channel using SSL encryption protocol. Our hotel reservation system never charges your credit card. Payment is to be completed directly with the hotel. This hotel has specified its room rates in Euro (EUR) and will confirm your booking in this currency. If you select another currency the rates will be converted for your convenience. Please note that this conversion is approximate and may differ from what you will actually pay because of exchange rate fluctuations. • Rates include all taxes and fees. • The hotel accepts Hungarian vacation cards.